If biology remains only biology, it is not to be feared. Much of the fear that does exist is rooted in the notion that God is in competition with nature, so that the more we attribute to one the less we can attribute to the other. That is false. The greater the powers and potentialities in nature, the more magnificent must be nature’s far-sighted Author, that God whose “ways are unsearchable” and who “reaches from end to end ordering all things mightily.” Richard Dawkins famously called the universe “a blind watchmaker.” If it is, it is miracle enough for anyone; for it is incomparably greater to design a watchmaker than a watch. We need not pit evolution against design, if we recognize that evolution is part of God’s design. (1) Here is one creationist’s attempt to unite the current teachings of evolution with the teachings of the Bible. But is it really this simple? Barr continues. Yet you will never hear these facts in evolutionary circles, nor in secular atheist college classrooms. But the absolute truth is that neither the study of Science, nor specifically the study of Biology, is incompatible with belief in Creation. They will in fact inevitably lead directly back to God. Do you believe the Bible, or do you believe “science”? More importantly, is there any rational or logical reason you must choose between the two? If one were to listen to the media hype, the Hollywood explanations, prime time TV, or many liberal college professors, one might assume there are just two choices in cosmology. A person can either can believe “science” or one can have “faith” in the Bible story. But is this even remotely true? Is it even sensible to place science and faith in different camps? Or is this entire scenario a false dichotomy? Many of my previous posts have already discussed the evolutionary side of this issue very thoroughly, and I believe we have more than adequately proven that belief in evolution is neither logical, nor scientific. Belief in evolution is clearly a faith based choice. If you read my earlier blogs, “Astonishing Ice Age facts“, or “The Data in the Strata“, or “A Totally Modern View on Evolution” you will understand that belief in Evolution is not a scientific choice or preference, but rather a philosophical one. There are vastly more scientific facts and principles supporting Creation, than those supporting the Big Bang or Evolution. Luskin “gets it”. Most secular atheists don’t. There is absolutely NO logical reason to separate science vs faith on issues of cosmology, or any issues related to where humanity or the universe originated. However, if one were to objectively discuss which cosmology has more scientific support, I believe firmly that Creation science would win the argument. Still, the point remains, there is no reason to “choose” one or the other. Science, unimpeded and freely practiced, is not in opposition to Scripture! As I wrote in the blog “BIG GOD. small god. Why Cosmology Matters. “Atheists say creation is impossible because it would have required something miraculous, something fantastic, something unbelievable, something outside the bounds of science. Creationists say that the The Big Bang and Evolution are impossible because they would have required something miraculous, something fantastic, something unbelievable, something outside the bounds of science.” And BOTH are correct. You have a mind. You have an intellect. (Both of which are, by the way, strong arguments for ID.) You get to choose whether you believe secular stories about a universe that magically appeared from nothing and life that created itself, or to believe in an Almighty Creator God. But you cannot use as your crutch any statement that you don’t believe in Creation because it is not scientific. Not if you want to be intellectually honest. (3) Stephen C. Meyer, Not by Chance: From Bacterial Propulsion Systems to Human DNA, Evidence of Intelligent Design Is Everywhere, Natl. Post A22 (Dec. 1, 2005). Posted on April 5, 2019 April 7, 2019 Tags atheism, big bang, christianity, cosmology, creation, darwin, education, evolution, faith, god, ID, natural selection, philosophy, science, scriptureLeave a comment on Is Intelligent Design Scientific? 9 Facts Evolutionists Hope You Never Learn. Scientifically speaking… someone lied to you. When they told you “Evolution has been scientifically proven” or “Evolution was the mechanism by which life appeared and grew on Earth“… they lied. They probably even told you if you ever doubted evolution, you must be a religious fanatic, science denier, or a hopelessly ignorant person. (Also a lie.) But here are 9 SCIENTIFIC problems with evolution. Just 9 are listed here, but there are thousands more.. The fossil record does not support Evolution. For proof see my prior blog post “The Data in the Strata” and also see “Intelligent Design has Scientific Merit in Paleontology” (www.discovery.org/a/7271). As written by Casey Luskin, “ID predicts irreducibly complexity. Because irreducibly complex structures require all of their parts to function, they cannot arise in a gradual, step-by-step manner. If many characteristics of life are irreducibly complex, then ID leads us to expect that the fossil record will exhibit a pattern of abrupt appearance of novel, fully functional body plans that do not develop in a gradual, step-by-step fashion. This is precisely what we typically find in the fossil record.” (1) So in point of fact, the fossil record actually supports CREATION. 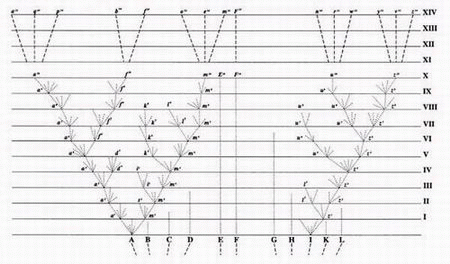 Molecular biology has completely failed to demonstrate Darwin’s “Tree of Life”. See my prior blog post “Branch or Vine?”. That diagram you have seen in dozens of textbooks, some sort of “tree” or branched diagram allegedly illustrating the “inter-connectedness of all species”… It doesn’t exist in nature. Nowhere in the real world have scientists found evidence that the species actually evolved, or are evolving, one from another. And genomics has virtually destroyed any possibility that such a tree could exist by showing patterns of genetic changes completely inconsistent with any known evolutionary paths. The Fossil record does not support gradual evolution. There are no proven transitional fossils. (There there should be countless billions of transitional fossils if evolution were true.) As stated in Wikipedia, “More than 99% of all species of life forms, amounting to over five billion species, that ever lived on Earth are estimated to be extinct. Some estimates on the number of Earth’s current species of life forms range from 10 million to 14 million, of which about 1.2 million have been documented and over 86 percent have not yet been described.”(2) Yet of all these millions of living and extinct species, none have been proven to be transitional! There is no evidence of current evolution. The rate of evolution required to transition from apes to man would have required extremely frequent changes (several positive mutations every year) in order to evolve in just a few million years. Yet in hundreds of years, no one has ever seen any current signs of evolution! And of course, this does not even account for the fact that negative mutations VASTLY outnumber any possible positive mutations, and these too are largely missing! Evolution cannot explain the origin of life. The law of abiogenesis states life cannot create itself. (3) This law has never been disproven. Evolution could never have occurred because life could never have begun. Even the most primitive forms of self-replicating life are incomprehensibly complex. The idea of a “primordial chemical soup” which is transformed into a living cell so completely unscientific it is laughable. (4) A single living cell is more complicated in its chemical and electrical engineering processes, as well as its manufacturing processes than the most advanced, largest city on earth! No “primordial soup” could have existed in the first place because the proteins would have of necessity been all isomers (not a random mix) and they would have been degraded by natural processes a thousand times more quickly than they could have ever formed. (5) Those ancient “experiments” from a hundred years ago which supposedly showed that the building blocks of proteins could have appeared accidentally when lightning hit ancient ponds were fundamentally flawed in dozens of ways. Posted on March 24, 2019 March 24, 2019 Tags archeology, atheism, christianity, creation, dna, education, evolution, god, Jesus, natural selection, philosophy, science, scriptureLeave a comment on 9 Facts Evolutionists Hope You Never Learn. We all know Christianity is under attack. Secular atheism has taken over the colleges, the prep schools, the media, the entertainment industry, and much of society. We have been passive for so long, and have lost so many battles, ceded so much ground that there is now an epidemic of mental health problems and all of society is suffering under the weight of sin and hopelessness. Drug abuse and addiction are rampant. The family is under siege. But all is not lost. At the center of all this confusion and suffering, I absolutely believe, lies the scientifically unpalatable and discredited theory of evolution. As stated by University of Chicago evolutionary biologist Jerry Coyne, “Evolution is the greatest killer of belief that has ever happened on this planet because it showed that some of the best evidence for God, which was the design of animals and plants that so wonderfully matched their environment could be the result of this naturalistic, blind materialistic process of natural selection.” Of course I vehemently dispute his assertion that natural selection could intentionally or accidentally design anything. (Please see prior posts on “Natural Selection” and “Branch or Vine”.) But I absolutely cannot disagree with his statement that belief in evolution kills belief in God. What we believe about our origins has a profound affect on what we believe about ourselves. I am confident that evolution will someday be exposed as the greatest lie in the history of science. Take a few minutes to view my blogs on “A totally Modern View on Evolution”, and “BIG GOD, small god: Why Cosmology Matters”. Or look at “The Data in the Strata” on my blog. You will find that none of the supposed scientific foundations of evolution are valid. You will find proof exposing many of the fraudulent efforts of secular atheists to promote evolution. And you will find there is no real scientific evidence to support the theory of evolution. Like most of you, I was taught in our secular schools that Creation was a myth, and that science had all the answers. Although I found this teaching upsetting to my core faith, I had no idea how to respond. Atheistic scientists and educators told us they had all the answers, and the Bible, we were told, was just a fairy tale. As a physician and a scientist, one who has studied this social phenomenon for decades, I am absolutely certain that the opposite is true. There is absolutely NO evidence that evolution or Natural Selection has created any of the immense variety of life on our planet. Yet Public schools and Universities continue to teach the lie. I would love to see the truth of the Bible brought forward in a way that offers a path to faith, hope, love, and most importantly salvation. My blogs at Evolutioncreation.net and Debunking-evolution.com offer the reader many scientific proofs of the absurdity of evolution, and the scientific impossibility of the Big Bang. In Pinellas County we have hundreds of churches serving a population of a million persons. It is the most densely populated county in all of Florida. Because of this we have a unique opportunity to serve, and to shine brightly for Christ in these dark days, and we can do so together. If the Body of Christ can unite in service to humanity here, we can show Truth to a doubting and confused world! But how can we act together? We can come together in 2 major ways. First pastors and ministers who are not themselves scientists, should look within their congregations for believers who are skilled and knowledgeable in the fields of science to help them, and to explain scientific principles. WE CAN NO LONGER CEDE THE INTERPRETATION OF SCIENCE TO THE ATHEISTS. Pastors and leaders should become familiar with the latest findings by reading books like “In Six Days” and “Refuting Evolution“. They should go to good websites like http://www.amazingfacts.org/media-library/book/e/33/t/how-evolution-flunked-the-science-test, or read my blogs listed above. And they should visit sites that support Bible history like the Ark Encounter, the Creation Museum, and The Museum of the Bible to find out how science supports the Bible. Second, it would be entirely possible for Bible believing pastors, Christians, and scientists in Pinellas county to begin a world class Creation museum and Bible history museum right here, serving not only the millions of people in the Bay Area, but also the ten million more who visit the Bay area on vacation every year. And in the process, by teaming up with other Christian ministries like the Museum of the Bible, we could offer hope and salvation to a generation that is lost and suffering without Christ. I work as an ER physician in Largo, and I live right here in Pinellas county. If you have caught a glimpse of the vision that I believe God has for us, please reply to this blog with a message, or email me at anmack55@aol.com. And please ask all your friends and fellow ministers to join the cause. Truth saves lives. Truth saves souls. May God bless you as you spread the Truth. Note the words “seems to have acted“, and “seem to have taken place“. It is refreshingly honest of the authors to admit the weakness of their position. Also note that the vast majority have arisen within a timetable compatible with the Bible “in the last 10,000 years”! In fact they even say that they have occurred since the Ice Age, which Creation scientists argue very convincingly, occurred soon after the flood! Also note that in spite of 10,000 supposed mutations, in approximately the last 10,000 years, people still people look, act, walk, eat, and talk like people. We cannot dig up skeletons or look at mummies from thousands of years ago and see any evidence of these supposed mutations. In fact, for the last several thousand years of recorded history, during this time of “accelerated human evolution” nothing about human appearance or capabilities appears to have really changed. Now note further, that the evolutionists themselves admit that the results they depend on are controversial, and have substantial limitations. Yet you will not see evidence of that uncertainty or controversy in the writings of most secular scientists, or hear it in their voices as they lecture on the supposed scientific certainty of evolution! From this we learn two things. First, these scientists who believe in evolution admit that the evidence support the sudden appearance of the modern human race (from whence they have no idea). Second, that using the exact same evidence, they come up with many different theories or explanations. Third, phrases like “you cannot predict” and “who knows” absolutely reek of conjecture, not scientific certainty! Yet they teach gullible college freshmen that they “know” evolution is a fact and creation is nonsense! The real fact is that mere guesses and conjectures about past events that occurred many thousands of years ago are not “science”. Claiming scientific credibility is not just an overstatement, it is a complete fabrication! Wherever you look into the details at the forefront of “evolutionary science” you will find observations and conclusions that are based not on science, but on the secular atheist world view! Posted on February 24, 2019 March 20, 2019 Tags atheism, christianity, creation, dna, education, evolution, science2 Comments on New Evidence Humans Recently Evolved? We have previously discussed the scientifically discredited evolutionary “Tree of life”. It appeared for nearly a hundred years in texts as an illustration of how evolution progressed from one species to another. It suggests that humanity evolved from apes, which evolved from other lower life forms, and eventually from some single celled organism such as a bacteria or slime mold. It suggests mankind is just one of the many thousands of branches on the random tree of evolution. Here are just a couple of the hundreds of variations. We showed that this imaginary “tree of life” has been totally discredited by scientific (not religious) means, such as archaeology, geology, paleontology and genomics. Proponents of evolution have tried to “improve” and “re-engineer” the diagram hundreds of times, but to no avail. It is finally being discarded by many who study evolution, yet it still appears in many recently published secular texts. You see, even pro-evolutionary institutions like Berkeley admit that NS does NOT explain the origin of life, that evolution is NOT random, that evolution can (and supposedly did) occur RAPIDLY, and that evolution cannot explain morality. (1) Yet all these ideas would have been considered anathema to Darwin. Most are the antithesis of evolution. As written by Dr David Raup, Dean of Science at the Field Museum of Natural History in Chicago, “We are now about 120 years after Darwin and the knowledge of the fossil record has been greatly expanded. We now have a quarter of a million fossil species, but the situation hasn’t changed much. The record of evolution is still surprisingly jerky and, ironically, we have even fewer examples of evolutionary transition than we had in Darwin’s time. (4) (Bold type added) When he states it is “jerky” that means animals suddenly appear fully formed in the geological strata… that sounds far more compatible with creation than with evolution! I have no intent to pursue this as analogy thoroughly here, except to say that how we view our origins has a great deal to do with how we view ourselves. Science, that is to say, true and intellectually honest science, is not incompatible with faith, or with the Bible. But the intellectually dishonest, secular atheistic, brainwashed view of science (more accurately called scientism) taught in our educational institutions now is an entirely different matter. Many of the authors and originators of Scientific study (Kepler, Galileo, Newton, Linnaeus, and hundreds more) were Christians, and for hundreds of years we have seen our standard of living, and our standards of education moving forward at a steady pace. But more recently scientific advancements have no longer been leading to increases in individual freedom, or an improved standard of living for society as a whole. We have instead seen burgeoning technological advancements that have created an unbelievably wealthy class of billionaires while doing little to advance the condition of the billions trapped in poverty. And worse yet we have seen a dark curtain of spiritual and intellectual dishonesty descend on our campuses, our media, and our entertainment industry. I think it is fair to say that the current trends in science are not leading to the betterment of society and mankind nearly as much as they once did. Perhaps, you say, that is a sociological or political question, not a scientific one. And certainly in one sense that is true. But each is connected and intertwined with the other. The sociological phenomenon of secular atheism, for example, which is overtaking our campuses is highly dependent on the belief in and promotion of evolution. So perhaps, just perhaps, Real Science, practiced in the setting of belief in a loving Creator, offers more hope and solutions than the pseudo-science of the secular atheists. Perhaps by reconnecting with “The Vine” also called “the way , and the truth and the life“(8), even science, cosmology, and our understanding of life itself will be greatly enhanced. Posted on February 19, 2019 February 27, 2019 Tags archeology, atheism, christianity, creation, darwin, education, evolution, faith, god, Jesus, natural selection, philosophy, science, scriptureLeave a comment on Branch or Vine? Evolution and Scripture.